Panel session prior to the meeting. Lots of good questions with plenty of discussion. 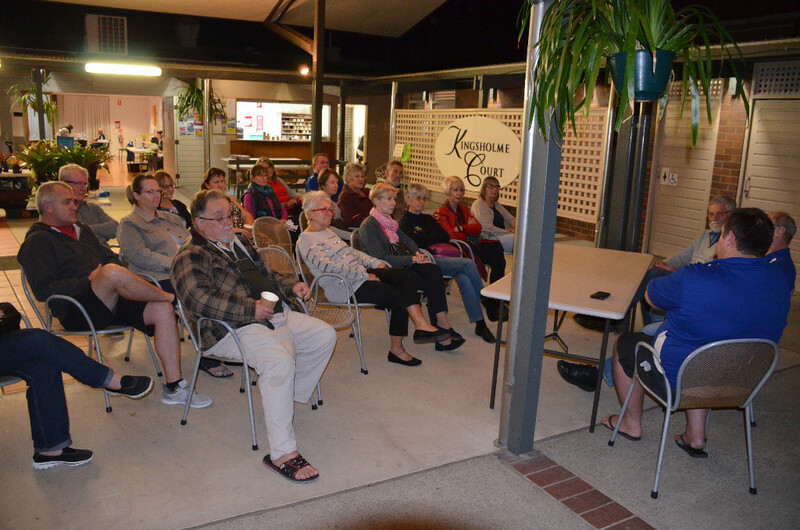 The information Q&A session consisted of a panel with Barry Kable, John Olsen and Tom Isaac fielding questions from the audience. Questions covered a wide range of topics from potting media and growing techniques through to general plant information. At 7.30pm, President Barry opened the meeting. Barry highlighted that the Autumn Show at Genesis College had been quite successful, and the Committee was now preparing for the Spring Show to be held at the new venue of the Belmont Rifle Range Complex. This site is close to the Gateway Arterial and should provide easy access for everyone. Plenty of parking will be available. The Committee also recognised the work done by volunteers at the Spring Show with a lucky draw for two helpers. Each was given a $50 voucher. 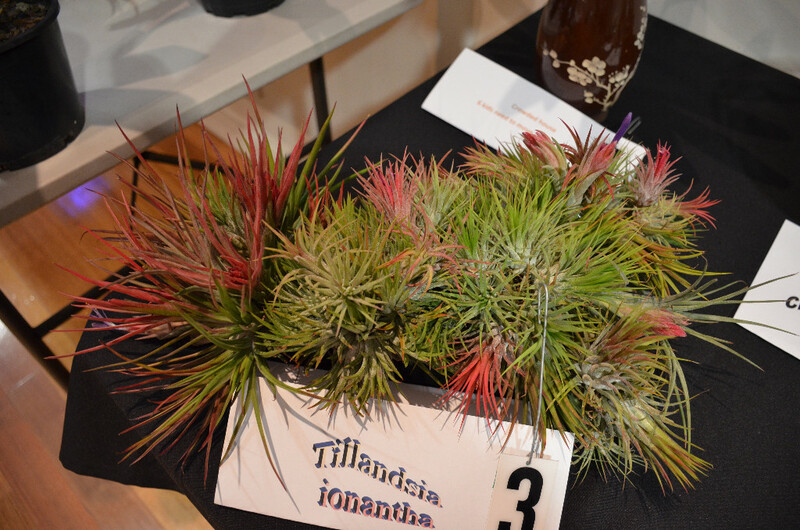 Winners of major prizes at the show were presented with their prize money. Barry reported that the Patron’s Day was very successful with over 60 members joining Len and Olive for a day of laughter and friendship. 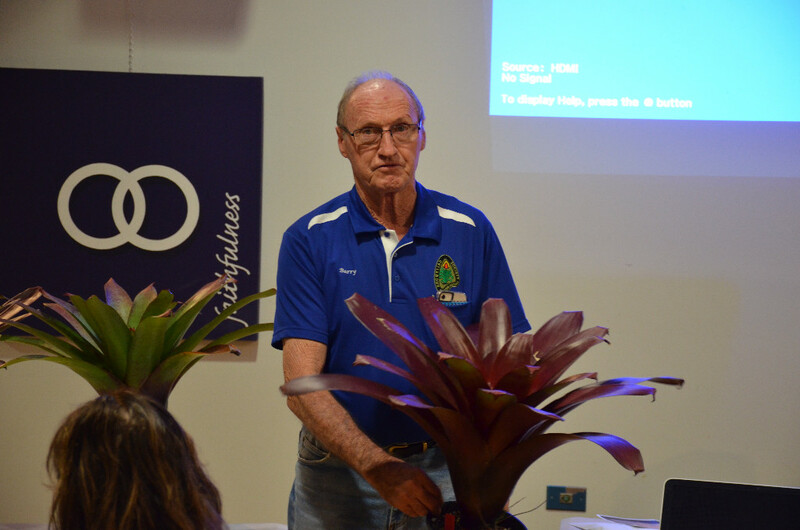 A guest speaker provided an insight into life at Bribie Island in the 50s while Len covered some of the early years of growing bromeliads. Becky entertained us with a quiz. Tours of the garden were given and lunch was provided for all. 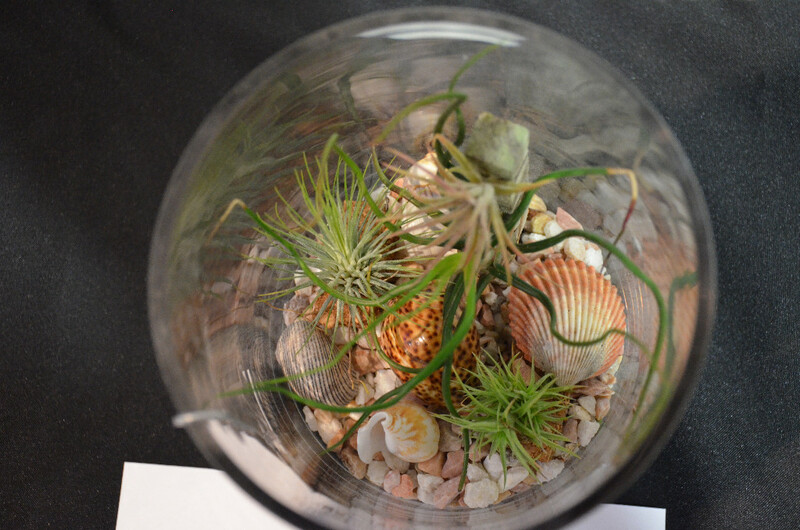 Finally, all attendees were given a plant to take home as a memory of the event. Thank you, Len and Olive. This was Alcantarea. Barry brought along a selection of his own crosses to demonstrate the variety that could be achieved. Crosses he had were Alc. ‘Divine Plum’ x Alc. vinicolor; Alc. vinicolor ‘Hawaiian Red’ x Alc. ‘Divine Plum’. The crosses produced plentiful seed. These crosses had a range of colours from greens through to reds. 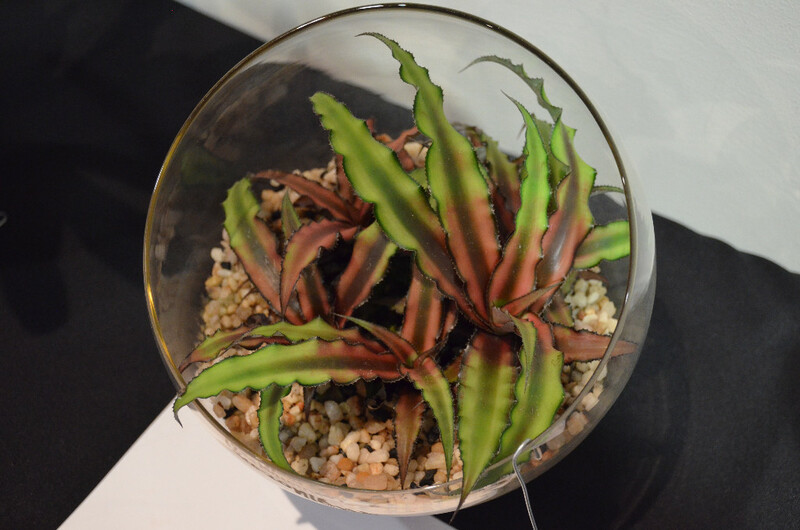 The age of the plant did show colour differences as well. Barry noted that some of his plants were flowering early. After some discussion this was thought to be related to them still being in small pots. Next, he had a variety of green Alcantareas. Alc. 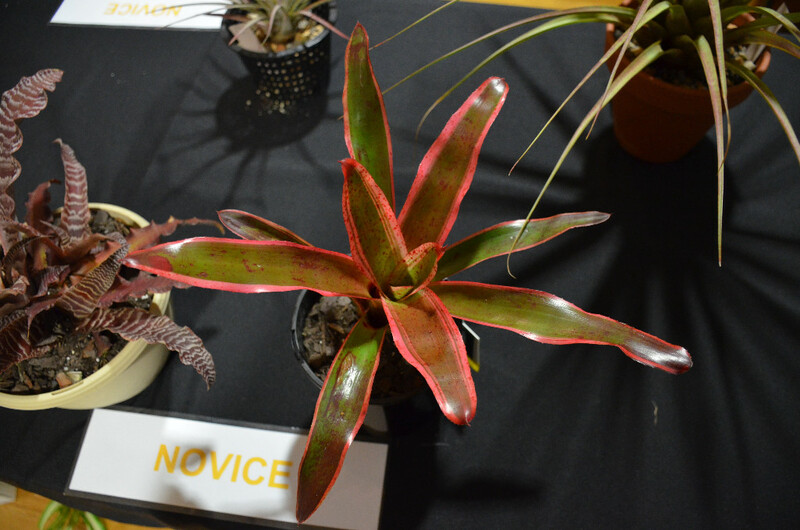 nahoumii had good leaf structure which could colour up with more red on the back of the leaf when grown in full sun. Barry and Arno King both mentioned the need to provide plenty of water to the roots to grow well. Fertiliser was also important. Many Alcantareas suffer from sunburn/bleaching during our hot summers – especially when grown in full sun. These plants look great when grown in the ground or in large pots (50cm or larger), and this helps them reach their full potential. 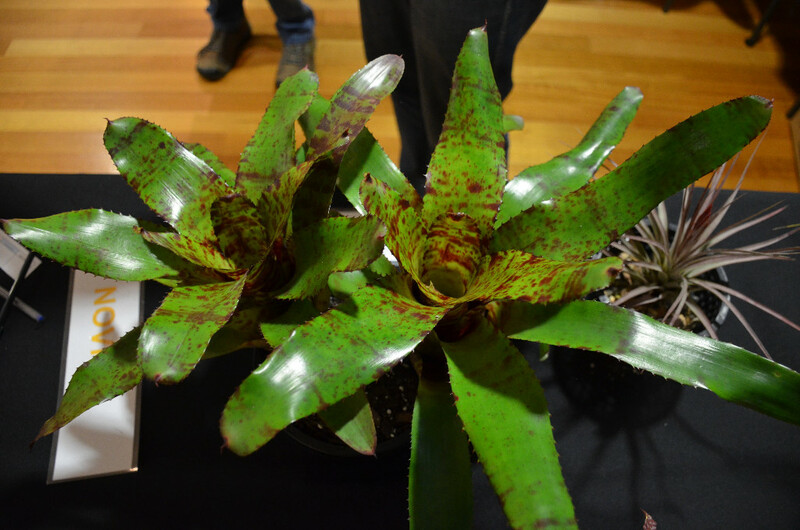 Steve Flood addressed the topic of Plants that Complement Bromeliads. Steve explained the various options using a range of photos that demonstrated key points such as using a highlight or dark colour as a background, ensuring that there was some separation between groups of plants. 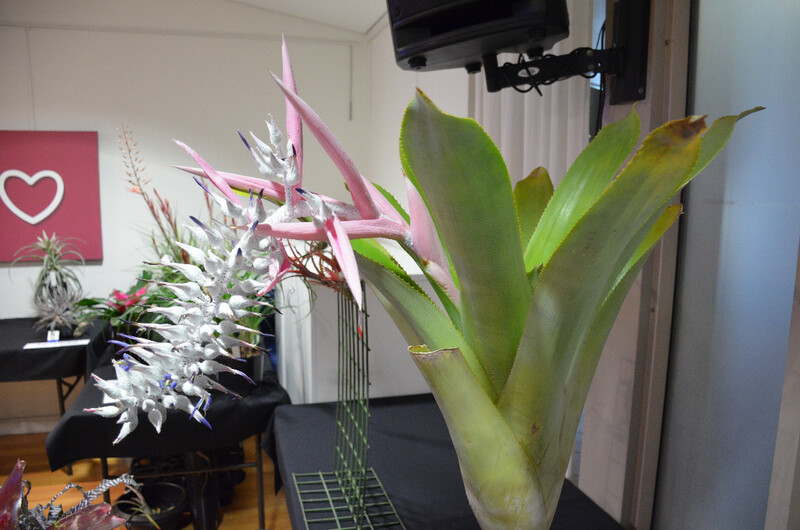 He recommended the use of Dracaenas and Cordylines to provide colour and height, and aroids – such as Anthuriums - to provide size and colour. 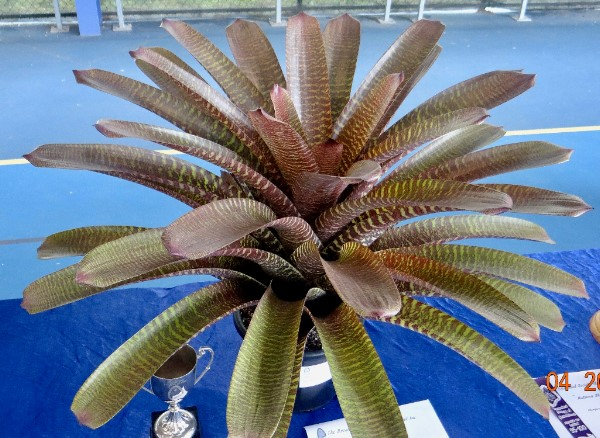 These plants would all grow in similar conditions to that required by bromeliads. Philodendrons require more sun. If palms were to be used, Steve recommended choosing these carefully as they presented a problem with their root systems and their hunger for food. In many cases, just adding mulch and planting into this was a good approach for areas where palms existed. Cycads could be used to provide some height and colour contrast. They will grow well in SEQLD. Frangipani is good to use as it provides protection during the hot summer months and then in winter allows lots of light and sun as leaves fall. However, Frangipani rust spoils these trees. Low growing begonias are a good plant to use on borders or as a mix with bromeliads. Blue used for borders creates a sedative effect; overuse which can be gloomy. 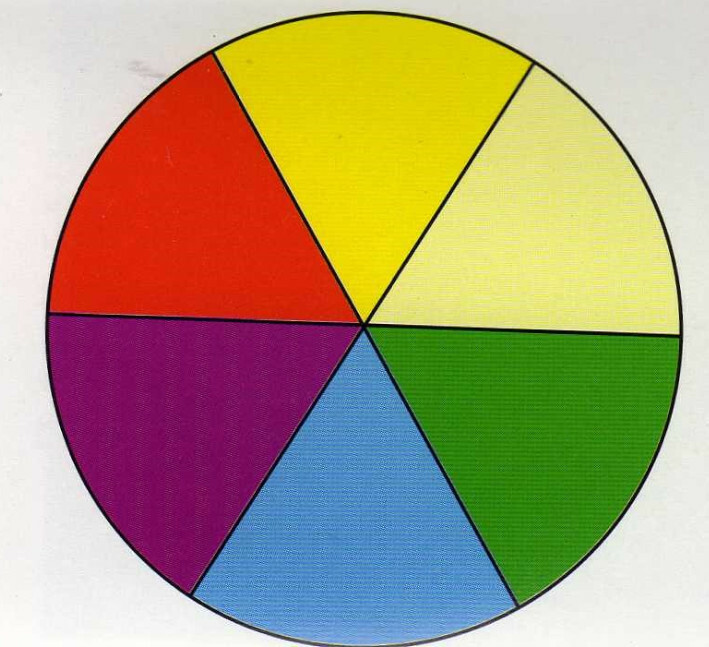 Follow the harmony colour wheel for guidance- see below. Barry and one of his Alcantareas. 3 Underwater Airium Alphonso Trudu. Unfortunately, I missed a photo of the Novice winner. Apologies to Alfonso. Intermediate - Graeme Stay's Ursulaea macvaughii. 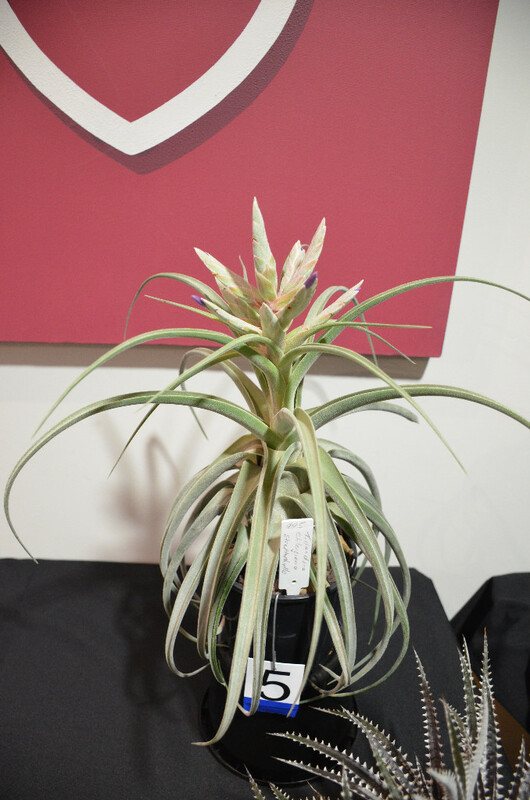 Advanced - Ron Jell's Tillandsia ehlersiana x streptophylla. 'Vrieseas' with Mal & Michelle Cameron. Bruce Dunstan with QnA on Fertlising.